Le Meadow’s Pantry is my new line of preserves that I sell at Farmer’s Market of the Sea to Sky and North Shore. Visit my blog www.lemeadowfoodstories.com to learn more! 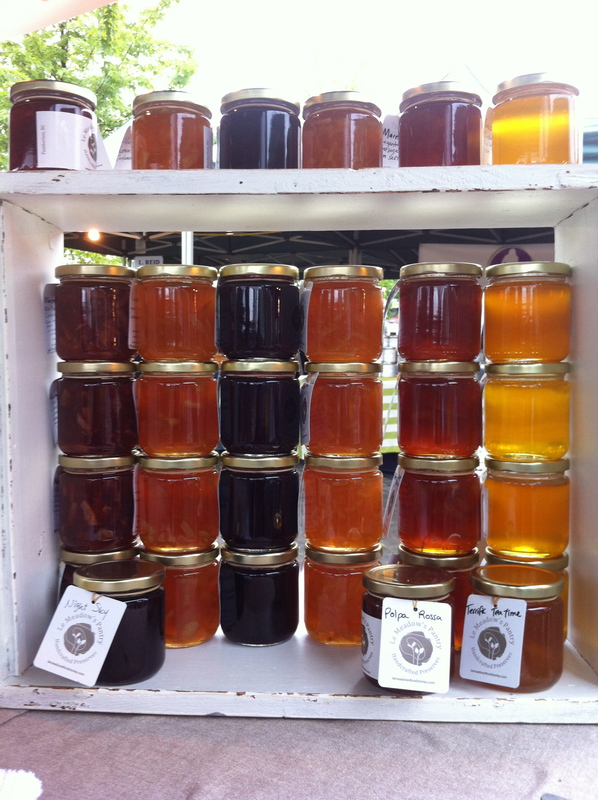 Le Meadow’s Pantry makes over 20 varieties of shelf-stable jam and marmalade. Cooked by hand, all natural, and using mostly local fruit. We combine old-world techniques and modern taste awareness to preserve that vibrant fruit flavour. 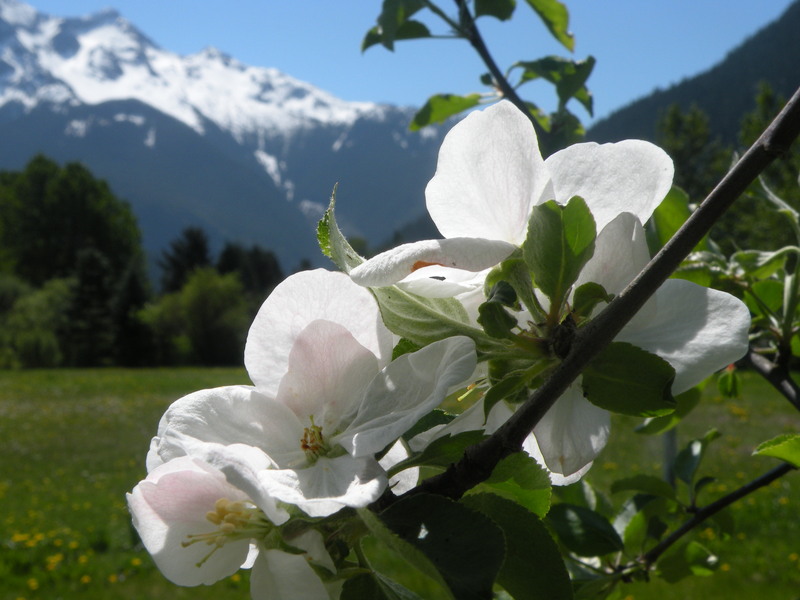 Much of our fruits are sourced locally from small farms and we also use some of the fruits that we grow at Le Meadow’s Pantry in Pemberton, B-C. The fruits on our farm are red and black currants, blackberries, crab apples, rhubarb, apples, gooseberries, goji berries and cherries. Our marmalades are made with high quality citrus from California and we use a traditional three-day technique. This labor intensive process is what gives our marmalades their rich and balanced flavour. To each batch we add local ingredients such as; organic vanilla and organic cinnamon extract from Pemberton Distillery,herbs and flowers from our farm, liquor, honey, and sea salt from Vancouver Island. Our jams are made with local fruits available in season and are cooked as quickly as possible to seize the pure flavour of the fruit and keep its intensely fresh taste. We try to make as much as we can while the fruits are perfectly ripe, but they sell out quickly so they may not always be available. You are always welcome to inquire about your favorite flavour, and we are happy to suggest another flavour that we think will appeal to you. All our preserves are made in small batches in copper preserving pans or enameled cast iron pans. Each pan produces about a dozen jars at a time. Cooking jams and marmalades in tiny batches are more work for us, but this is how we achieve such delightful and luscious preserves. Cooking smaller batches captures the bright flavours and the essence of the fruits. 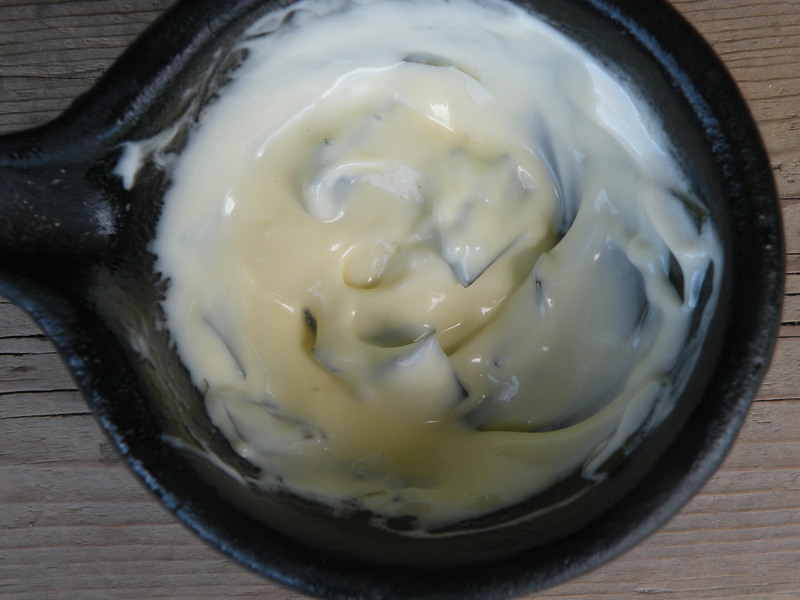 The intense, sublime sauce called aioli, a classic of Provençale cuisine, is the essence of simplicity and flavour. 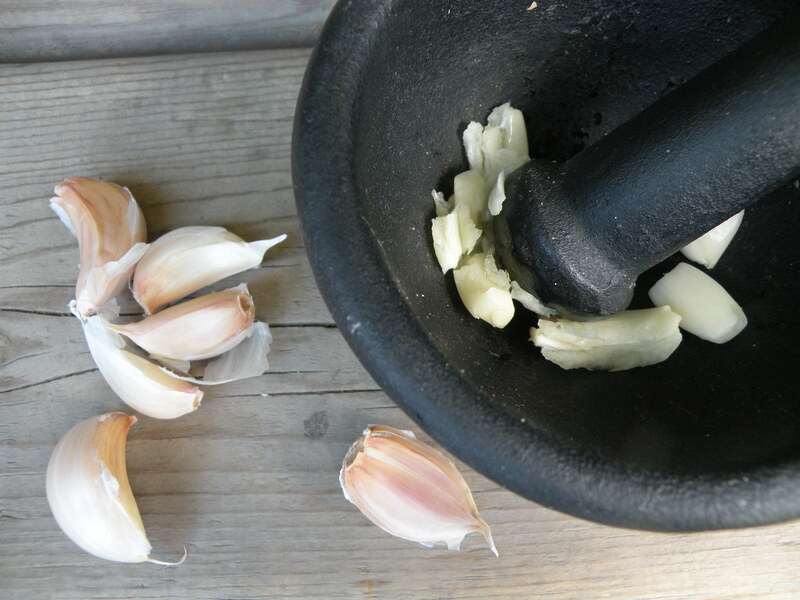 The garlic you use is crucial: it needs to be as fresh as possible. Look for solid heads with tight, papery skins. 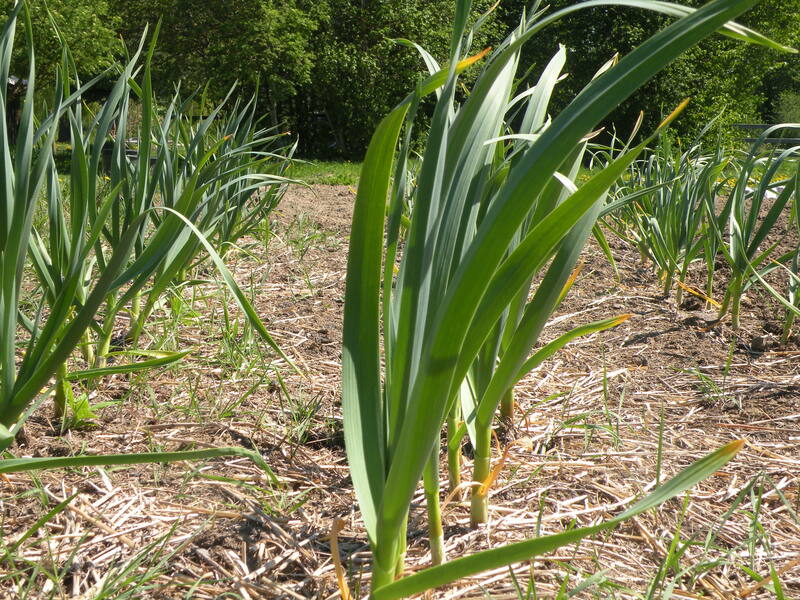 If the clove is too old, the garlic will be too strong. I recommend that you use a mortar and pestle but you can also use a blender; the consistency will be creamier and more like mayonnaise. Wakame ( Undaria pinnatifida) is a seaweed rich in calcium, iodine, iron, protein and niacin. Wakame also aids the digestion of fat, and with its slightly sweet flavour and tender texture it is an excellent addition to this traditional aioli. In traditional Chinese medicine, it is a cooling food and both a blood and yin tonic. It helps to reduce conditions of excess heat, water, mucus and dispel toxins. It reduces vata. High quality dried wakame can be found at natural food store or online. 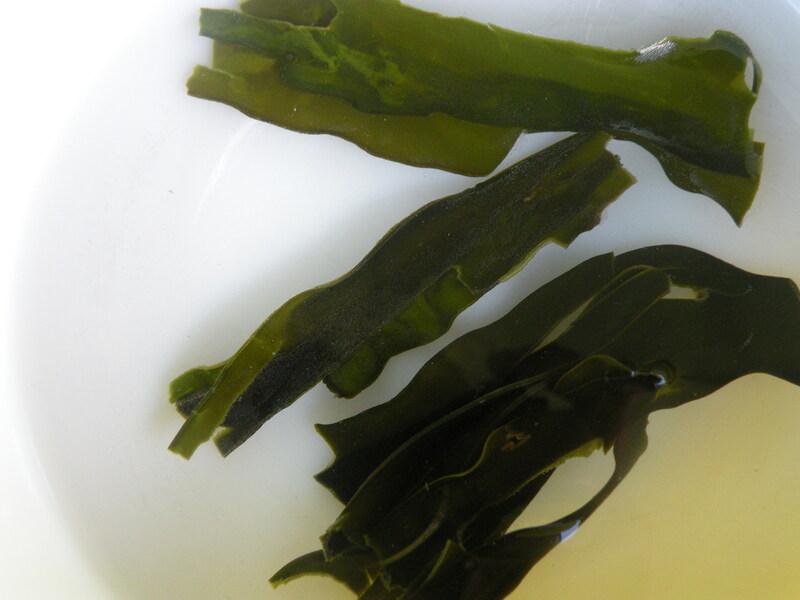 Once hydrated, wakame should be cooked for about 7 minutes, or until softened. Fresh wakame requires refrigeration and prompt use. 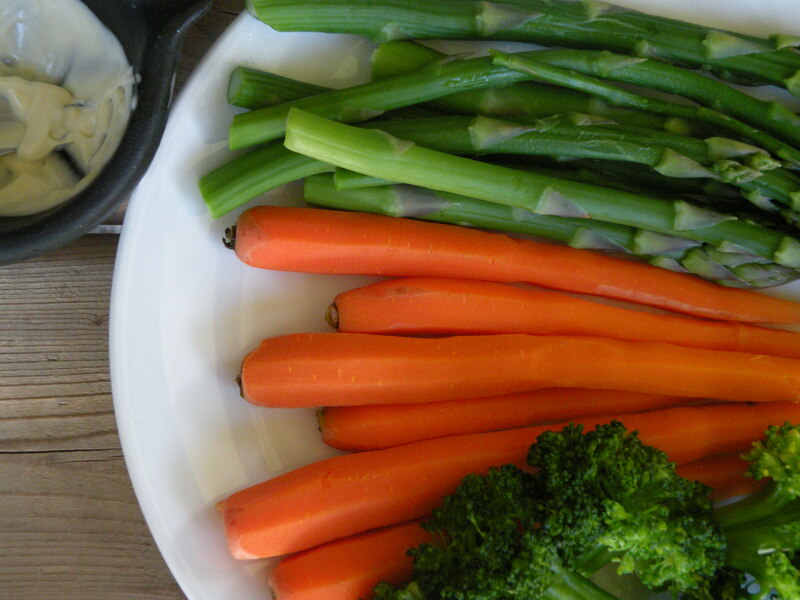 Aioli makes a wonderful sauce for vegetables, sandwiches, salads, grilled fish or meat. 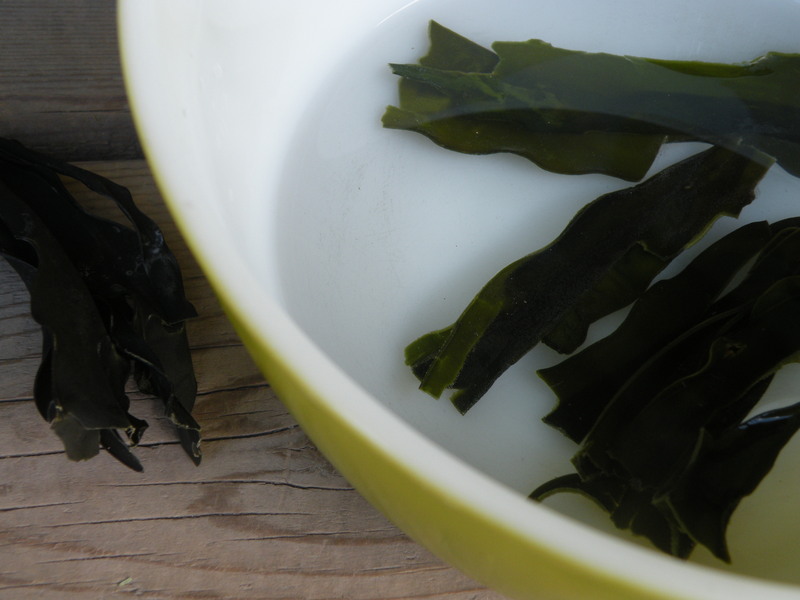 1.In a small pan, hydrate the wakame in water to cover for about 3 minutes, or until softened. Cut out the center stripe and discard. Return in the pan and bring water to a boil, lower heat and cook 7 minutes. Chop the wakame into 1- inch pieces and set aside. 2.Combine garlic, wakame, salt, and 2 tablespoons oil in a blender at high speed until smooth and creamy, about 2 minutes. 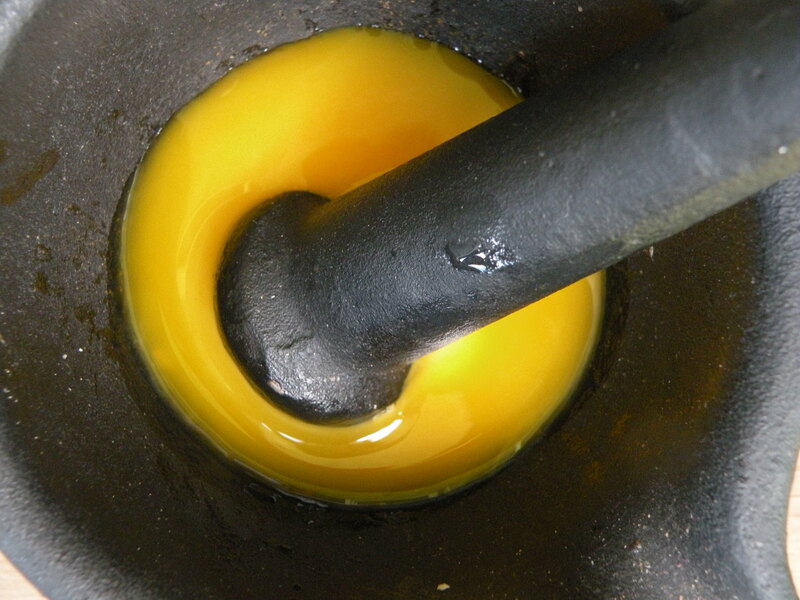 3.Add egg yolks and, with motor running, very slowly add remaining oil in a thin, steady stream, blending until aioli is thick. This will take about 2 minutes. The aioli can be refrigerated, covered, for up to 2 days. The flavour of morels varies; it may suggest warm autumn leaves, hazelnuts, or even nutmeg. As with truffle and caviar, tasting is believing. The morel is a small, conical mushroom crisscrossed with irregular pale brown ridges and has a sponge like appearance. The flavour of morels is nutty and earthy, milder than that of most other wild mushrooms, and their honeycomb crevices and hollows have a great affinity for cream sauce or for stuffing. Morels are usually between two and four inches long, and range in color from pale cream to almost black. They are often found at farmers markets and specialty stores and through numerous online mail-order sources. Select fresh morels that have a sweet, earthy smell and are firm but not slimy. Morels appears in the spring when flowers are blooming. Whether wild or cultivated, mushrooms need circulating air when stored. They are best kept unwashed, in paper bags on a refrigerator shelf. To wash morels, drop them into a bowl of cool water and give them a good swish with your hands, letting any grit fall to the bottom of the bowl, them lifting them out of the water and pat them dry with a cloth. Dried morels are also available and a good substitute when the season is over. The flavour is generally more intense than the fresh ones. After soaking, strain the flavourful soaking liquid and add it to your dish if possible or use as a broth to make soups. Morels also grow in forests which have been burned by a forest fire. Morels can be found under or around many trees such as tulip poplars, ash, hickory, dead or dying elms, cherry, old apple trees, striped maple,and sycamore. 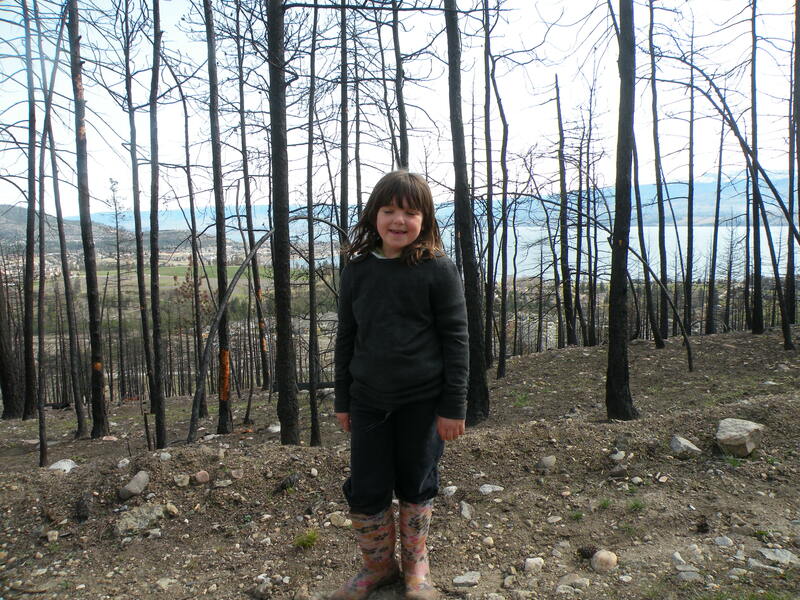 All types of morels may also grow in forests which have been burned by a forest fire. Other signs to tell when morels are ready are when the flowering quince, the dogwoods, the violets and the trillium blooms.If you decide to try foraging them for yourself, do so with an experienced guide. Morels pairs well with asparagus, butter, caraway seeds, cream, garlic, lamb, pepper, shallots, ramps and thyme. Like all mushrooms, morels contains small amounts of toxins, which are neutralized with thorough cooking. Considered a tonic to the digestive system by traditional Chinese medicine, morels help resolve mucus and toxins. They are also a good blood and chi tonic. Mushrooms are a rich source of glutamic acid (the natural version of the flavour enhancer msg) and so enhance the flavour of any savory dish. They are high in protein and a good source of vitamin B2 and zinc. The radish is an annual plant that is grown for its peppery edible root. They originated in Europe and West Asia and were used as food plants and medicine by many early civilizations. 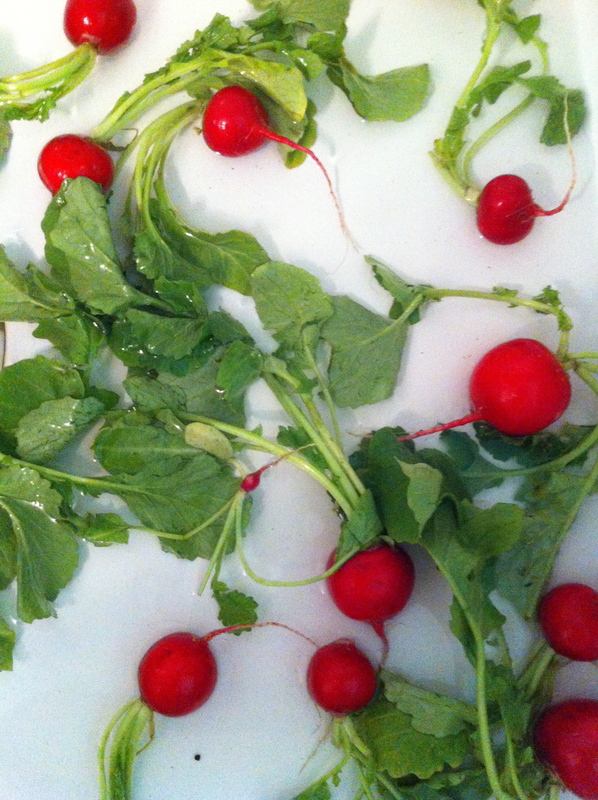 Radishes are entirely edible, although the root is usually the preferred part. Roots can be eaten raw, pickled, or added to stir-fries. Young greens can be added to soups, steamed or stir-fried. According to traditional Chinese medicine, radish is a cooling food, it support chi circulation, help remove toxins, and dispel excess heat and mucus. 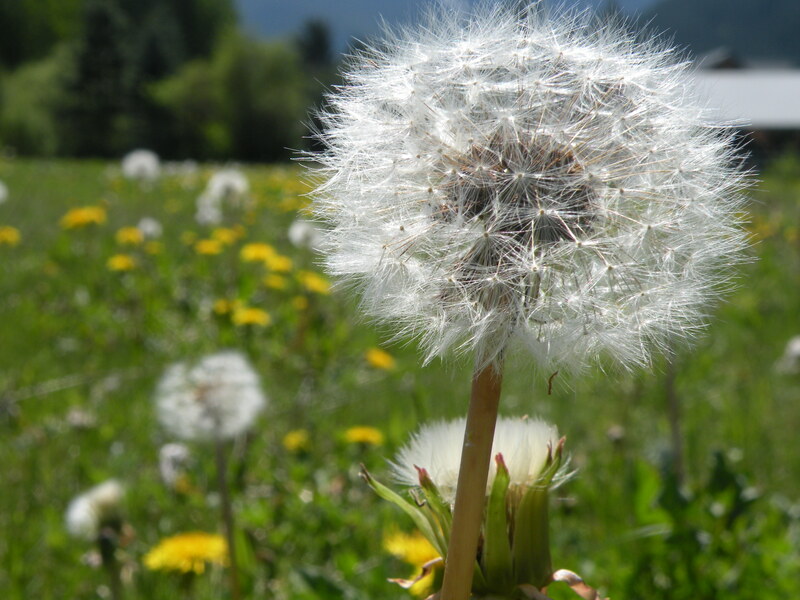 They also act on the lung and stomach meridians and are an excellent digestive aid. 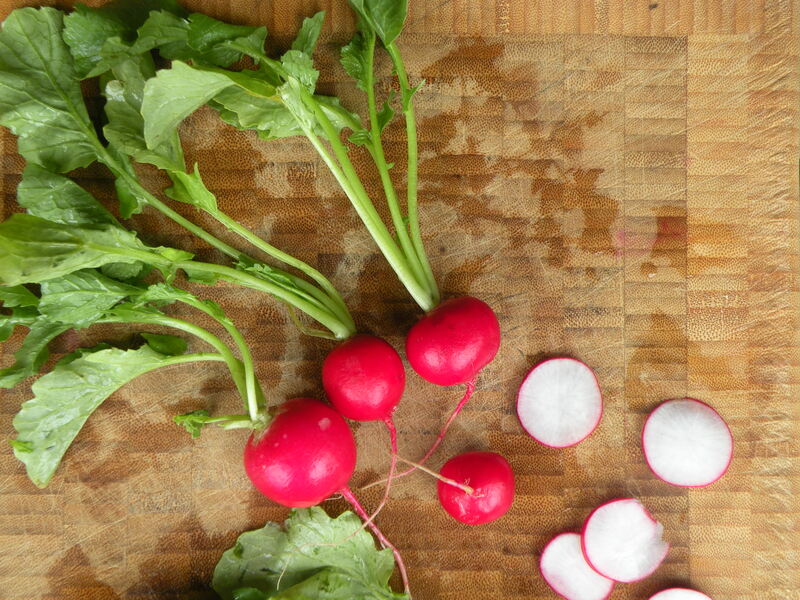 Radishes are a good source of ascorbic acid, folic acid, and potassium. They also contains vitamin B6, riboflavin, magnesium, copper, and calcium. 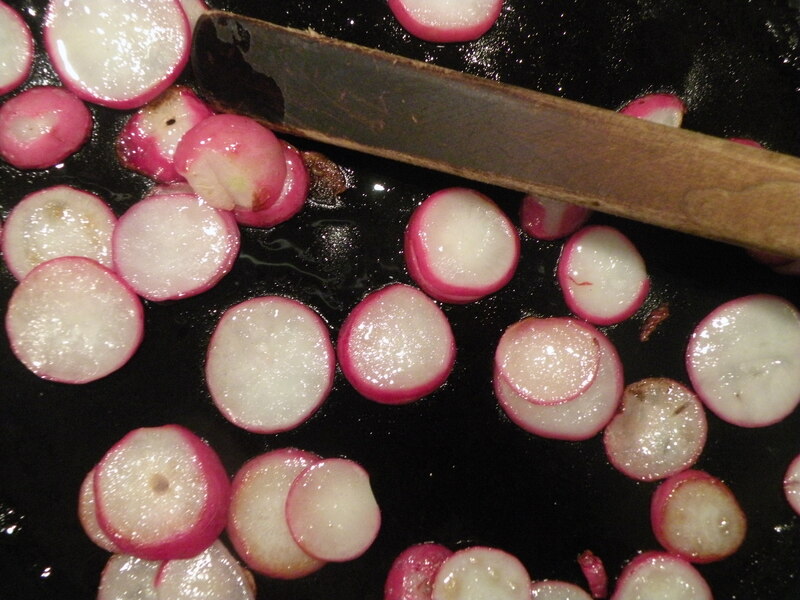 Radishes are commonly eaten uncooked. Experience how delicious they are when lightly sautéed. The pungent flavor and cooling nature of the raw radish disappears and the texture becomes soft and moist. 1.Whisk 2 tablespoons olive oil with lemon juice, garlic and honey in a large bowl to blend. Season dressing to taste with coarse salt and freshly ground pepper. 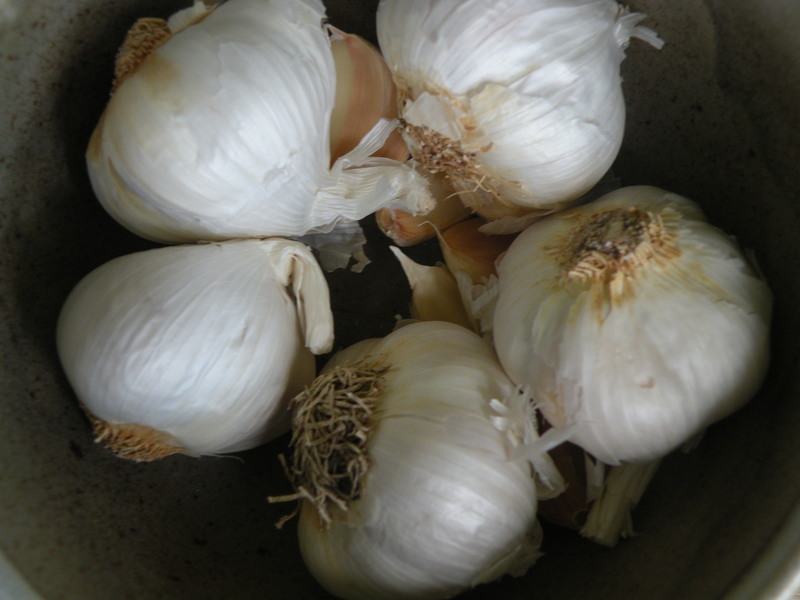 Leave the garlic infuse until serving. 2.Place the mushrooms in a large bowl. Toss with 4 tablespoons butter or duck fat. Scatter mushrooms on a rimmed baking sheet. Sprinkle with coarse salt and pepper. Roast until tender, stirring occasionally, 20 to 25 minutes. Cool. 3.In a heavy skillet, heat 2 tablespoon butter or duck fat, add the radishes and sauté 3 or 4 minutes, or until lightly softened. 4. Remove the garlic from the dressing. 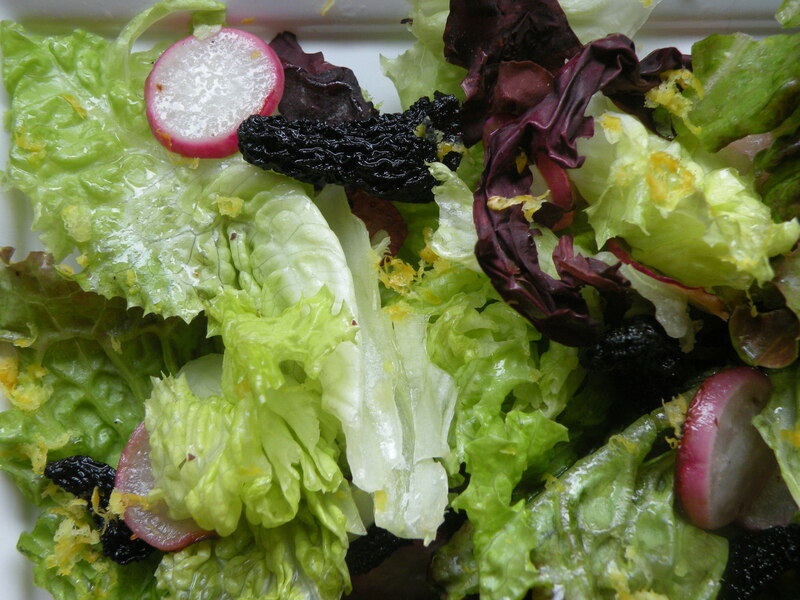 Add lettuce, radishes, dulse and mushrooms to the bowl with the dressing and toss to coat. Adjust salt and pepper. 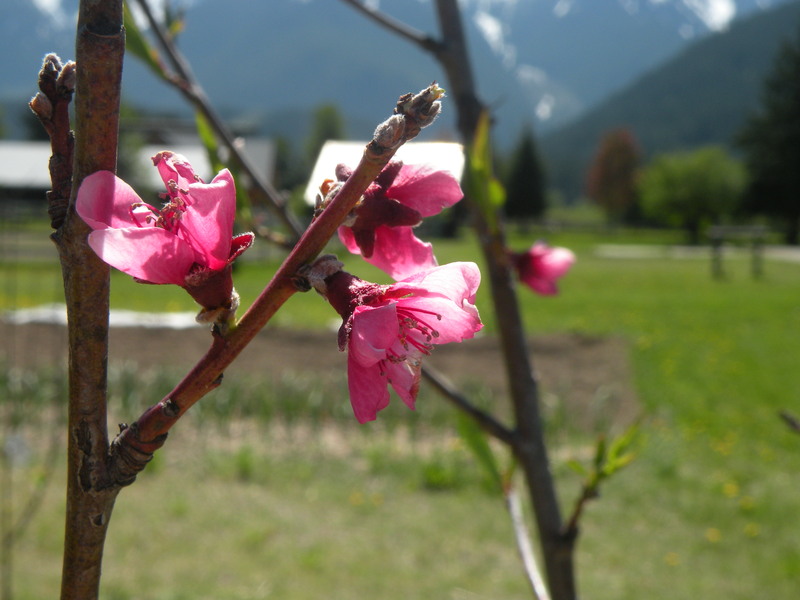 With the beginning of Spring, we become more lively and energetic. We naturally want to lighten up, expand and renew ourselves. 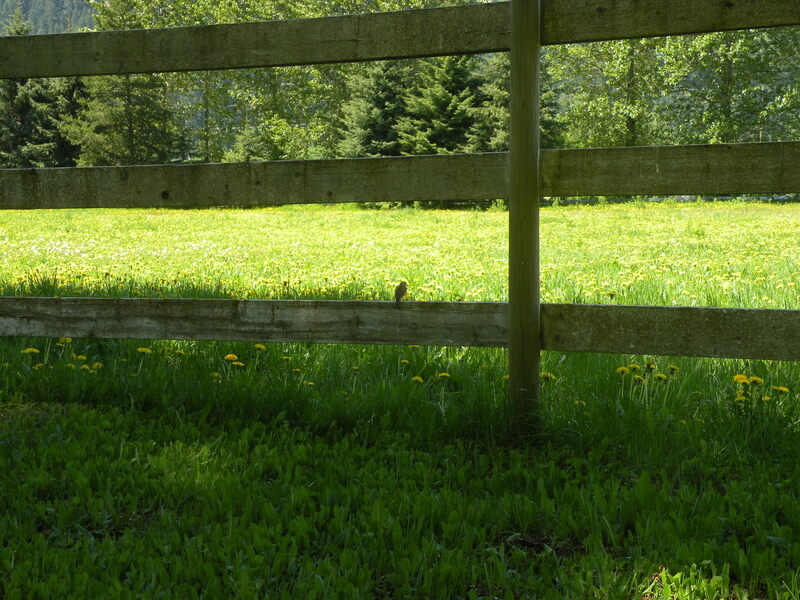 The energy of Spring is ascending, active and about new beginnings. 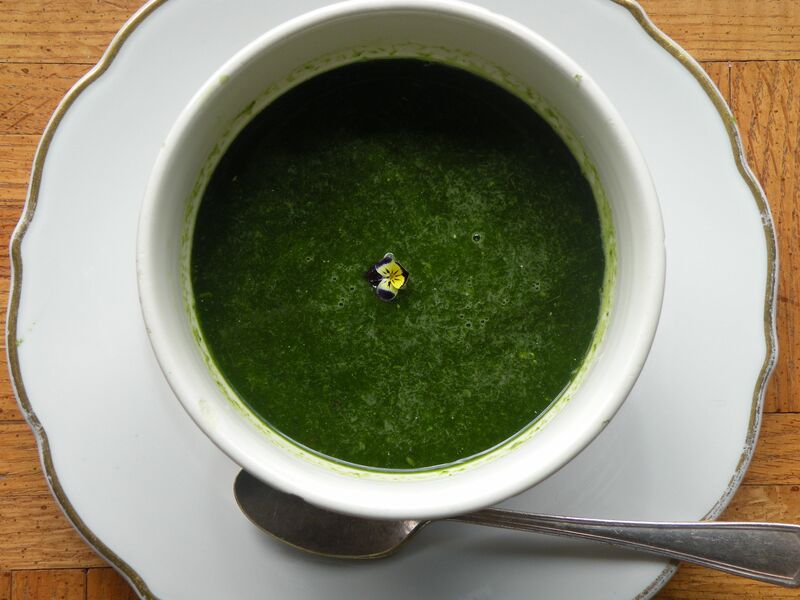 The green colour dominant in nature nourishes the soul, our appetite for rich warming food is decreased and the body starts a natural cleanse. The pleasant cycle of the season starts again and we see things in new ways. Many people choose transitional seasons to cleanse, clearing out the old and preparing for the new.To gently encourage the renewal process and to rid the mind, body and soul of what is no longer needed, we must take care of the liver and gall bladder. Bitter foods and herbs offer excellent liver-cleansing effects. Some of these foods are rye, quinoa, romaine, spring greens, asparagus, citrus peel, alfafa, chamomile flowers and milk thistle seeds. Including edible wild plants in your diet from your neighborhood is also helpful as they are usually stronger than cultivated varieties and you only need small amounts to be beneficial. The sweet flavor in whole grains, legumes, seeds, carrots, beets and honey are helpful in harmonizing liver energy. Adding small amounts of the sour flavour by using apple cider vinegar, rhubarb, lemon, lime and grapefruit may help activating the natural detoxification process. Adding pungent herbs in your cooking like basil, fennel,caraway, dill, rosemary, garlic and onion will stimulate liver energy flow. During the spring we can take advantages of the fresh green foods around us to lighten our bodies for the summer months ahead. A gentle whole foods detoxification can go a very long way to restoring harmony and health to your system. Green foods have heavy concentrations of chlorophyll that oxygenate the body and enzymes that rejuvenate the body. They are responsible for virtually every chemical reaction at the cellular level. Eat as many leafy green vegetables as you want, the deeper the green, the better! Mineral rich foods like root vegetables are also very important to include as they contain minerals essential to the optimal functioning of the body giving you energy and clarity. Staying away from the most common toxic and inflammatory foods, ~refined sugar, artificial sweetener, alcohol,yeast, fried food, caffeine, homogenized dairy, gluten, processed foods, etc.~ increasing your intake of whole foods and keeping a balanced lifestyle are helpful ways to discharge accumulated toxins in your body. Following a light whole food cleanse each season for a short period of time ~a week to 10 days~ give you an opportunity to find out more about your body and how you feel when you feed yourself highly nutritious foods. Once you are done, you may want to eat more in tune with the season, add more vegetables to your diet, and commit to eating less refined foods, sugar, wheat and salt. Reflect on what you learned from your own experience and continue to eat the foods that make you feel good and energized. What foods work well for you on a cleanse? Which foods will you continue to have on a regular basis? This is a gentle yet effective infusion to support the liver, the organ associate with spring. 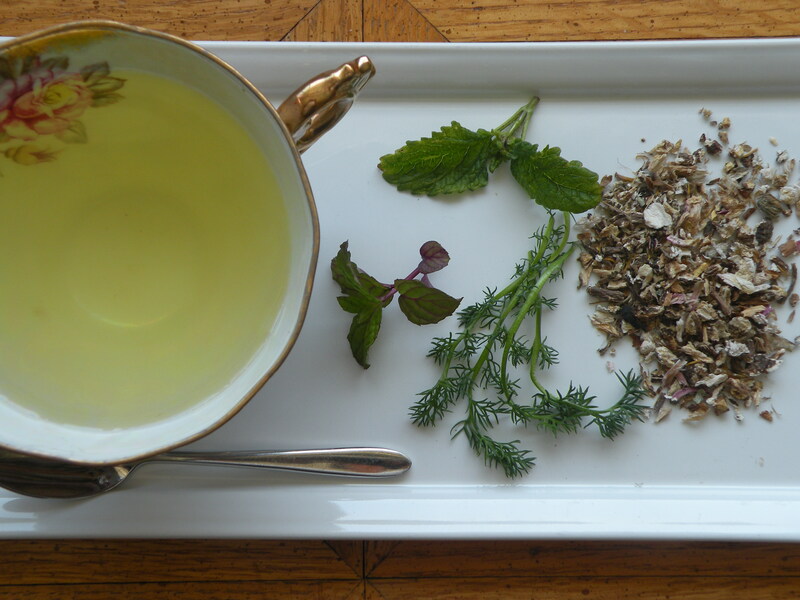 The bitter herbs ~dandelion root and chamomile~ offer an excellent liver-cleansing effect, while the more pungent herbs ~spearmint- and lemon balm~ stimulate the liver out of stagnancy. The addition of honey and apple cider vinegar assures a smooth flow of emotional and physical energy and activates the detoxifying properties of this tea. 1.In a medium sauce pan, pour 1 1/2 liter of water, add the dandelion roots, bring to a small boil, lower heat, cover and simmer for 30 minutes. 2. After 3o minutes, remove from the heat. Add spearmint, chamomile and lemon balm. Allow steeping for 20 minutes. 3.Strain and discard the herbs. 4.Drink warm or room temperature, preferably on an empty stomach throughout the day. 4.When serving, add 1 teaspoon of apple cider vinegar and 1 teaspoon honey. 5.Keeps 2 days in the refrigerator. Asparagus has often been praised as one of the most refined and delicious vegetables. Asparagus is a member of the lily family and a distant relative of onions. The cultivars range in colour from dark to light green through to violet and white. White asparagus have a milder flavour than the green asparagus and are more popular in Europe. In it’s growing stages, the stems are heaped with sandy soil to block out sunlight, preventing the chlorophyll to develop. 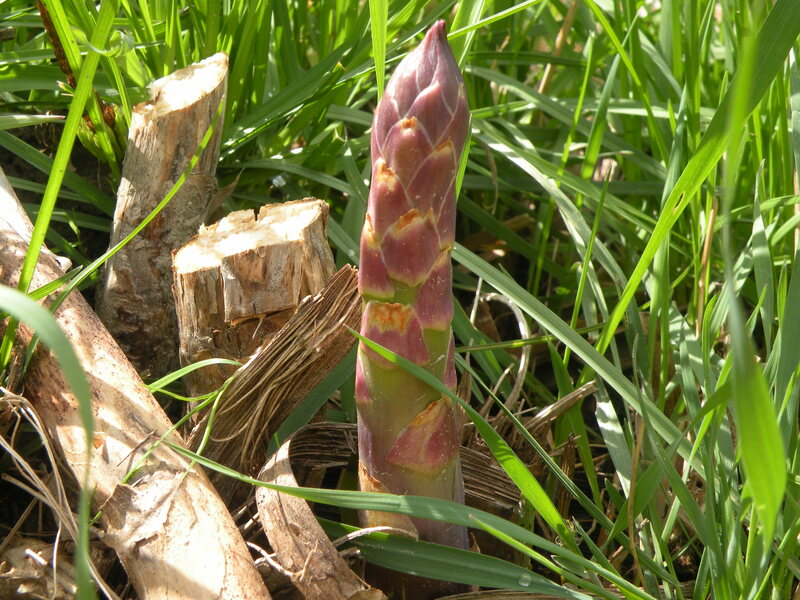 The purple asparagus, less fibrous and higher in sugar is becoming more available at specialty food markets. Asparagus botanical name “Asparagus Officinalis” means “from the dispensery“. 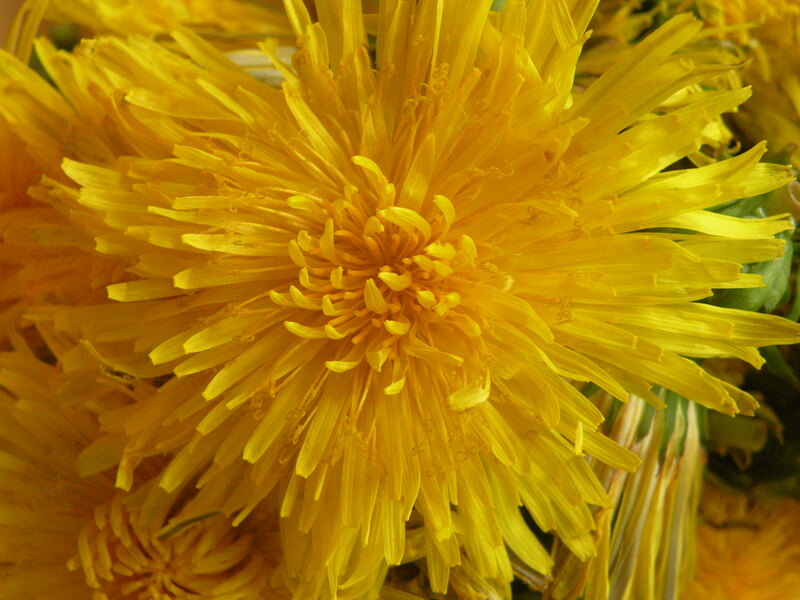 It was a favourite among the Romans for it’s medicinal virtues and was used as a diuretic and a laxative. It was also thought to help with toothache, cramps and sciatica. Asparagus contains asparagine, an essential amino acid and the first to be isolated from it’s natural source early in the nineteenth century. Asparagine is also a diuretic that gives the urine a characteristic odor in people who lack the gene to break it down. This was first recorded in eighteenth-century Britain by Queen Anne’s physician! Asparagus has remarkable immune-strengthening, antioxidant and anticarcinogenic properties due to the bioflavonoids rutin and glutathione. It is high in protein, an excellent source of potassium, vitamin K, folic acid, vitamins C and A, riboflavin, thiamine, and B6. In traditional Chinese medicine, asparagus are said to be a cooling yin tonic that energizes the kidneys, lungs and spleen. It also helps to dispel heat, damp and water. In Ayurvedic, Asian asparagus are used for strengthening female hormones, promoting fertility, increasing lactation, and relieving menstrual pain. ~Shatavari is the Indian name and it means : she who possesses a hundred husbands. The young stems of asparagus are preferably steamed, grilled or quickly boiled and served with butter, vinaigrette or hollandaise sauce. Asparagus pairs well with goat cheese, parmesan and pecorino cheeses, chervil, omelets, lemon, olive oil, shallots, pancetta, tarragon, and, white wine. 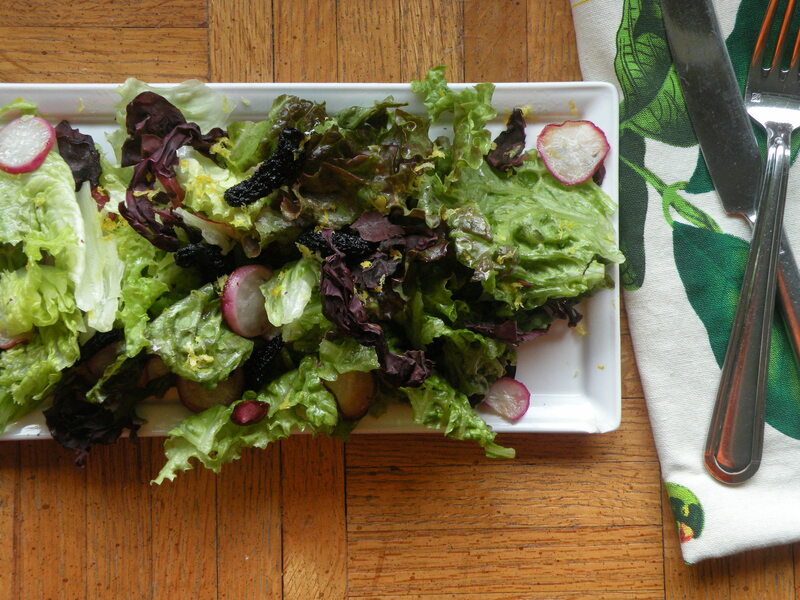 This salad is a great way to signal that spring is here. The mung beans, wild rice and asparagus create a flavour that is both earthy and delicate while the lemon zest enliven the dish. Wild rice is very high in protein, minerals, and B vitamins. The small khaki Mung beans are the perfect beans for Spring; easily digestible, they are beneficial for the liver and gall bladder and detoxifies the body. Whisk together green onion, lemon juice, and ½ teaspoon salt in a large bowl; season with pepper. Whisking constantly, pour in oil in a slow, steady stream; whisk until emulsified. Set aside. 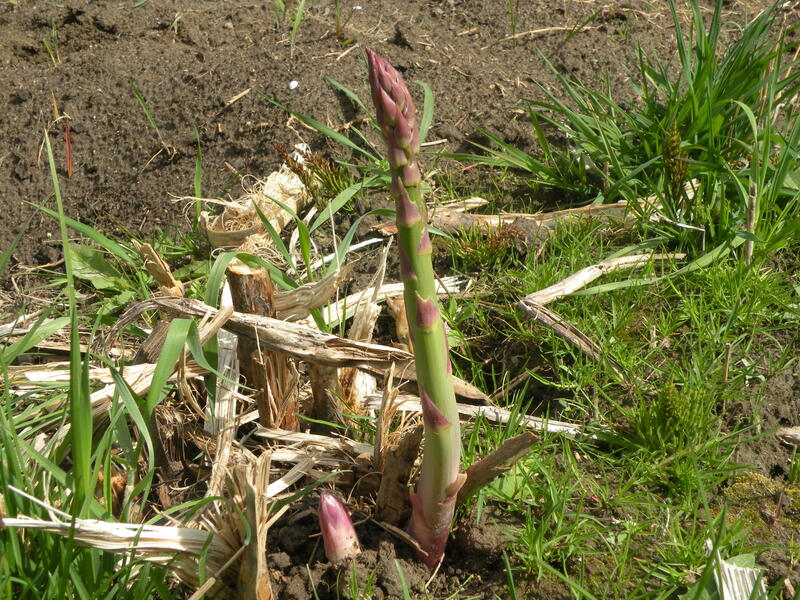 1.Snap of the tough ends of the asparagus. Cut the asparagus into 2 inch long pieces. Drop them into boiling salted water and cook for 1 minute, or until bright green and tender but still a bit firm. Rinse under cold water and drain well. 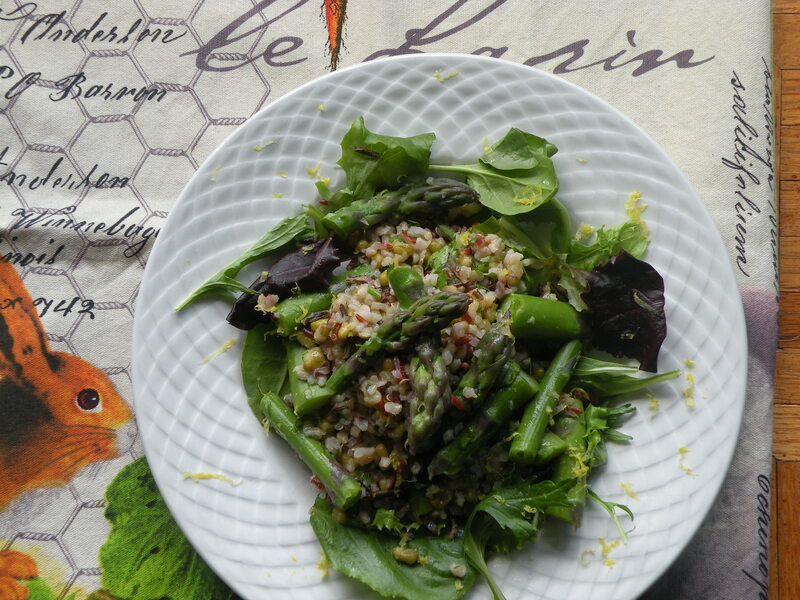 2.Combine the asparagus, wild rice, parsley, mung beans, and lemon zest in a large bowl. 3.Pour over the dressing and toss to combine.Adjust salt and pepper. 4.Line a serving platter with greens and put the rice salad on top. ~From an Anishnabeg (Ojibway) thanksgiving for spring. Rhubarb has been grown for a long time in Asia as a medicinal plant. It originated from Siberia or Tibet and its Latin name signify barbaric roots. It is likely due to it’s infamous name that was not used in cuisine until the early 1800s. 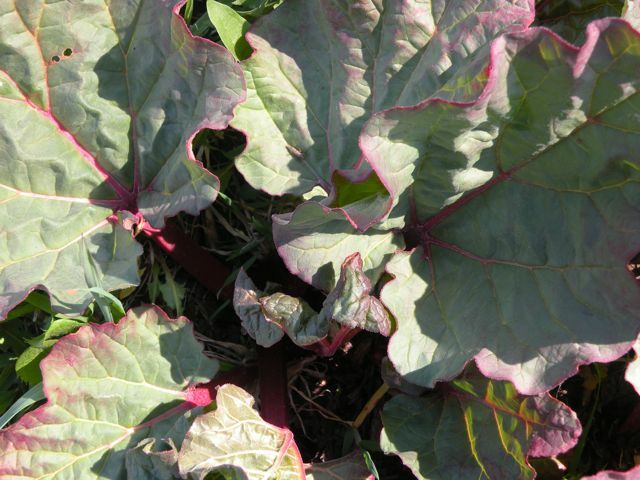 Today, there are two main species grown for culinary usage, Rheum Rhabarbarum and Rheum Rhaponticum. Even if rhubarb is a vegetable, it is almost always used as a fruit to make pies, jams and compotes. Rhubarb may be harvested in the spring or fall but in the spring the quality is at its best. It is appreciated for its acidulous taste and the tannin that makes your mouth pucker up. 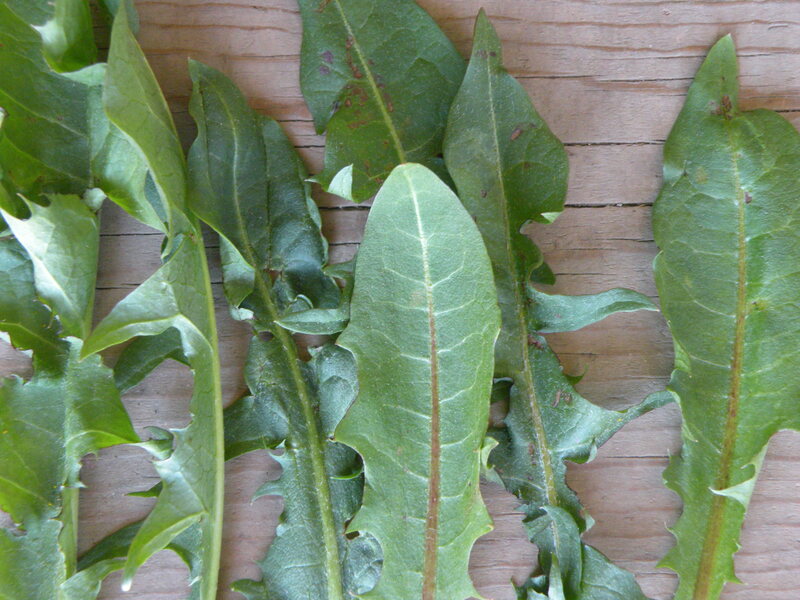 Only the stalks are eaten and you should never eat the leaves; they have been associated with cases of poisoning due to their high concentration of oxalic acid. Rhubarb is rich in potassium, iron, magnesium, calcium and in vitamin C and A. It is said to be astringent, laxative and purgative. In Chinese medicine it is used as a cooling food to remove toxins and heat and helps blood circulation. It also reduces vata when use a little at a time. 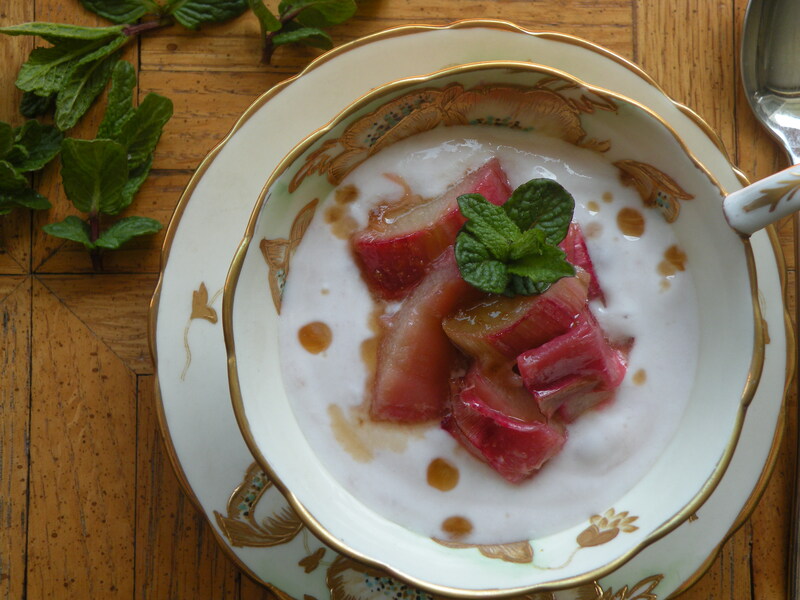 Creamy Roasted Rhubarb with Maple Syrup. Preheat the oven at 400 f. Place the rhubarb in a lightly buttered roasting pan, drizzled with maple syrup, and toss well. Roast for 15 to 2o minutes until tender. Place the rhubarb and juices in a bowl, drizzle with maple syrup and let cool completely. Serve over yogurt with fresh mint, or add to a smoothie with blueberries, orange juice, roasted rhubarb and cinnamon. From the nettle’s lesson. Proverb, 1753. Nettles (Urtica Dioica) are worth searching for; used throughout the world to build vitality, they are delicious and once cooked they have a delicate flavour and a pleasant texture. I always look forward to finding the first young nettles of spring to make soup, infusion or pesto; it’s a great way to mark the start of the growing year. Nettle tops are best gathered- carefully- before they set flowers, nettle stings causes temporary burning and irritation so make sure to wear gloves. Avoid nettles close to roadsides and select only the fresh, young top growth. If nettle doesn’t grow where you live, you may find them at farmer’s market. 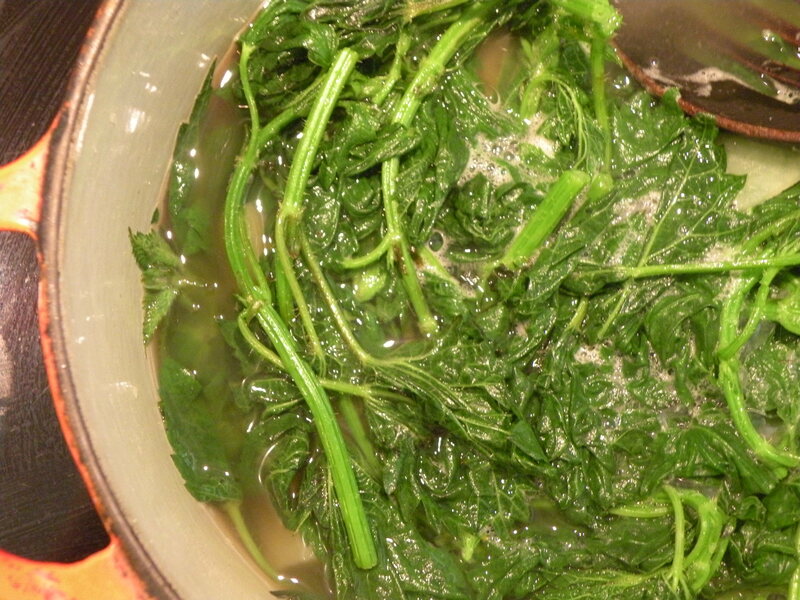 Nettles lose their sting once chopped, dried, or cooked. The nettle is a perennial plant full of iron, calcium, magnesium and nitrogen, which makes it incredibly nutritious for both plants and humans.They also increase circulation and provides external treatment for arthritic pain, gout, sciatica and neuralgia. Rich in minerals, they increase the hemoglobin in the blood, purify the system and have a generally toning effect on the whole body. 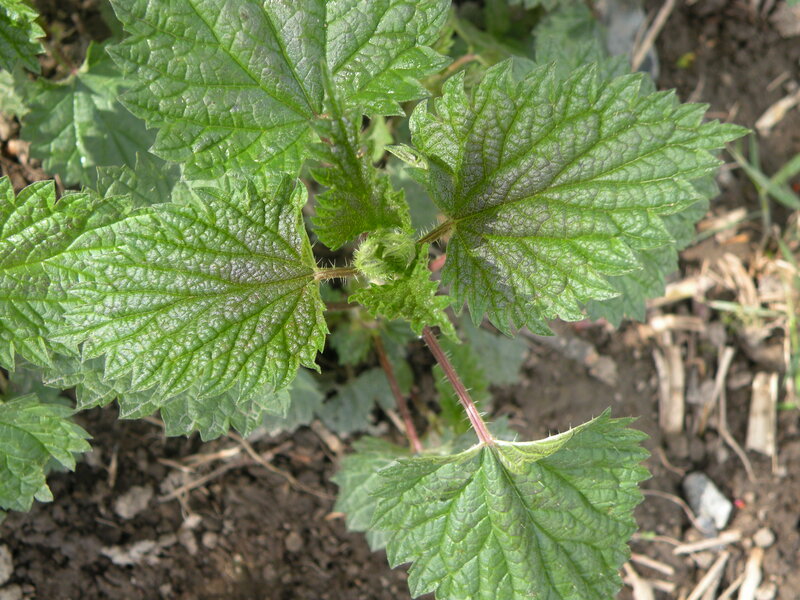 According to Chinese medicine, nettles are a yin and blood tonic that support the bladder, kidney, spleen, and liver. They also have diuretic properties and enrich the blood, thicken the hair and may help reduce blood sugar levels. Nettles reduce pitta and kapha and can be used, in moderation, by vata. Crème fraîche, chive blossoms or sweet violet for garnish. 1.Warm the oil in a large soup pot. Add the onions and garlic and cook over medium heat for several minutes until the onion is soft. 2.Add the potatoes and all the greens. Cook until the greens are wilted. Add the vegetable broth, 1 teaspoon salt and kombu. 3.Bring to a boil, then lower the heat and simmer until the potatoes are soft. 4.Cool lightly, remove the marjoram or oregano and pour into a food processor and purée until smooth. 5.Adjust salt and add freshly ground pepper. 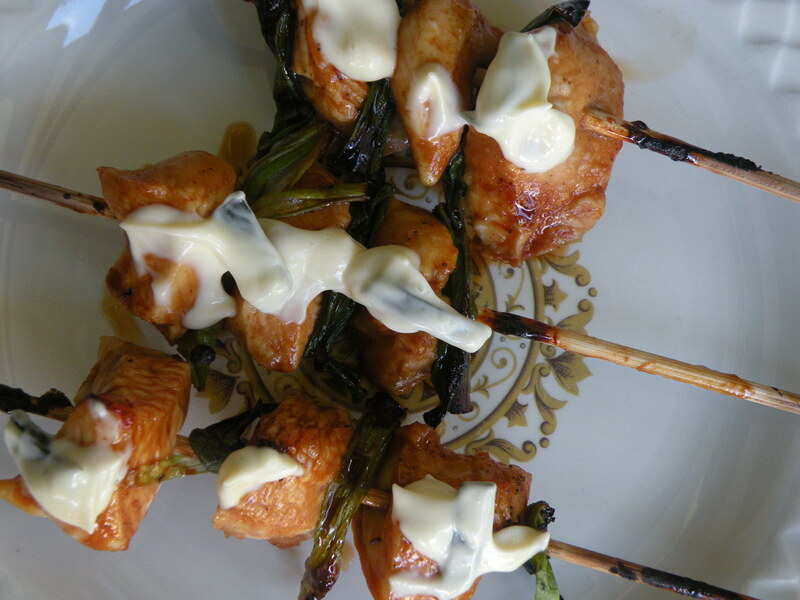 Serve with crème fraîche and decorate with sweet violet or chive blossoms. For information, comments and feedback or to book a consultation or purchase an eBook.